Celebrate With Shmulik: A local author helps kids commemorate Yom HaAtzmaut. A rose by any other name might smell as sweet — but some names might not be as easy to pronounce and remember, especially for children. That’s what a Farmington Hills author thought about as her children’s books gained the attention of publishers. She decided to use her first and middle names, Lisa Rose, as pen name while restricting her maiden name (Granitz) and married name (Chottiner) for personal purposes apart from public attention. 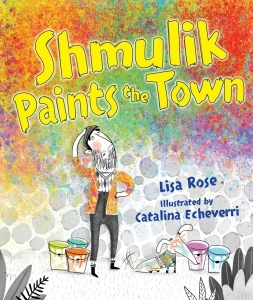 “My pen name is the way I’m known on my author website [lisarosewrites.me] and on social media,” says the author, 42, who is about to launch Shmulik Paints the Town (Kar-Ben Publishing; $7.99), her first picture book in print. The book, to be introduced on the afternoon of Sunday, March 13, at the Jewish Community Center, celebrates Israeli Independence Day (Yom HaAtzmaut, which falls this year on May 11), which commemorates the Israeli Declaration of Independence in 1948. The story introduces a procrastinating painter who is asked to decorate for the holiday, celebrated with family picnics and barbecues. He is accompanied by his dog, who ultimately takes charge of the requested responsibilities. After Rose reads to the group, children will get into the creative spirit by painting benches to remain at Shalom Street, where the launch will be held and where kids are encouraged to participate in special activities. “In the book, a dog gets to paint; at our launch party, there will be the chance for kids to experience painting,” she says. Rose has written two ebooks, Oh No, The Tooth Fairy Broke Her Wing! and Oh No! The Easter Bunny Is Allergic to Eggs!, both published on MeeGenius, a division of Houghton Mifflin Harcourt. “I try to think of funny things and write quirky,” explains Rose, who has taught early childhood education in Pontiac and Highland Park, where her students often were homeless. The link to the Jewish holiday happened after suggestions during meetings with local members of the Society of Children’s Book Writers and Illustrators. The manuscript had been dormant a while until she was prompted to tie it to the calendar. Rose, interested in writing since second grade and while growing up in West Bloomfield, fulfilled another and more practical interest by becoming a teacher. She earned her bachelor’s degree in education at the University of Michigan and her master’s in reading at Oakland University. The author and husband, Jeff, an engineer, have an 8-year-old daughter, Victoria Rose. As a family, they participate in the Friendship Circle, supplementing Victoria’s participation in activities at the Jewish Community Center. “I really feel good about knowing what will appeal to children,” says Rose, who had her bat mitzvah at Temple Kol Ami and looks forward to celebrating the 30th anniversary of that event. The original idea for the Shmulik book came about from a cousin who develops paintings around paw prints submitted by pet owners. The idea is to provide important artistic keepsakes. “The moral of the Shmulik story is perseverance,” Rose says. Barely a month after the book was published, Rose has been honored by being chosen as a PJ Library author. A program of the Harold Grinspoon Foundation, PJ Library every month sends free Jewish children’s books to families across the world with the goal of sharing Jewish stories that can help families talk together about values, traditions and culture. PJ Library is made possible through partnerships with philanthropists and Jewish organizations to serve families with youngsters from 6 months to 8 years old, bringing Judaism into their lives regardless of Jewish background, knowledge or observance. Rose has lots more to share as she develops other works, including a middle-grades novel with a graffiti artist and a digital media project with the producer of Eminem’s Eight Mile. 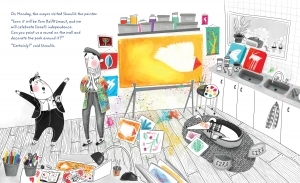 As Shmulik Paints the Town joins the children’s books distributed around the world as part of a free program offered by PJ Library, local Jewish families with young children are reminded of the reading and music opportunities available to them. Signing up for PJ Library means a young child can receive a free book every month except December, when music will arrive — each delivery chosen to explore a Jewish theme. The program, developed in 2005 by Harold Grinspoon as part of the Harold Grinspoon Foundation, is operated out of Massachusetts and reaches 430,000 recipients globally. “There is a Book Selection Committee [of educators and librarians] that chooses from books already found interesting and contacts made with publishers and authors,” explains Meredith Lewis, director of content and engagement. 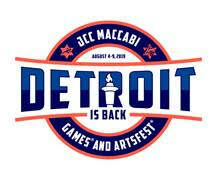 The Jewish Federation of Metropolitan Detroit is an implementing partner for PJ Library. 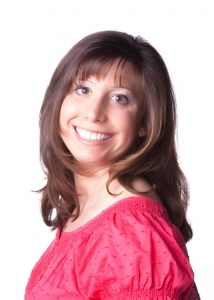 Gail Greenberg is the key contact person. PJ (for pajamas with the goal of reading becoming part of a bedtime routine) Library was inspired in part by Dolly Parton’s Imagination Library, which provides free books to children. It also was inspired by personal experiences Grinspoon had as he observed adults reading to children. To measure the program’s impact, PJ Library commissioned a 2013 survey of American families raising Jewish children. Among the findings, 57 percent of families reported that PJ Library has made them more aware of Jewish holiday and lifecycle events. Seventy-five percent said the materials have increased discussion of Jewish-related concepts and values. To sign up for the program, go to pjlibrary.org. 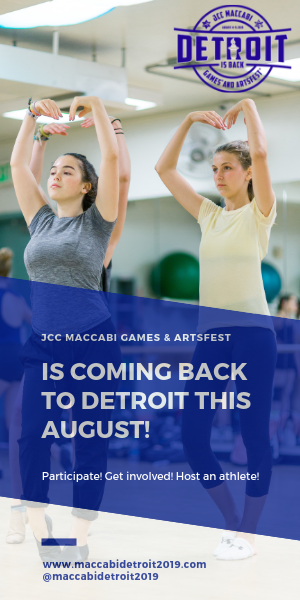 For local information, contact Gail Greenberg by emailing greenberg@jfmd or calling (248) 205-2536. Lisa Rose will launch her new book 1-3 p.m. Sunday, March 13, at Shalom Street in the Jewish Community Center in West Bloomfield. Lisarosewrites.me.